The 10 day trip includes stays at Xixim, CoquiCoqui, and Casa Sandra, boutique hotels chosen for their serenity and wellness ambiances. The first few days are full of mind and body exercises at CelestunBiospehere Reserve, followed by visits to Mayan ruins, and ending with a stay on the practically undisturbed island of Holbox. Arrive Merida 3 Nights > Drive Valladolid 2 Nights > Drive Holbox 4 Nights & Drive Cancun & Leave. Today we visit the Celestun Biosphere Reserve where you can choose from several activities. You can bike several miles around the reserve, kayak the local waters or enjoy the Wellness Center. The Wellness Center offers the following: yoga pavilion with wooden floor under a beautiful circular palapa; group pavilion space for Tai Chi, Pilates, dance, drumming, and other group activities with ceiling fans; group workshop; aditional sunrise and sunset-facing outdoor terraces for outdoor yoga practice and meditation; circular wellness pool with round Jacuzzi and deeply relaxing oval poolside beds; healthy snack bar with vegetarian options; juice therapy, based on organic fruit and vegetable combinations, enjoyed in a harmonic circular thatched palapa; SPA bungalows with privacy screens open to the sea for healing massage, aromatherapy and other treatments; fitness gym immersed in tropical vegetation, with specialized cardio, strength-building and balance equipment. Upon return to Hotel Xixim, from your bungalow you will have direct exclusive access to 3 miles of white sand beaches filled with shells and conchs. On the Xixim beach you can chill out under our shady ramada resting areas, sunbathe, play volleyball, or sail in a kayak, all without additional cost. 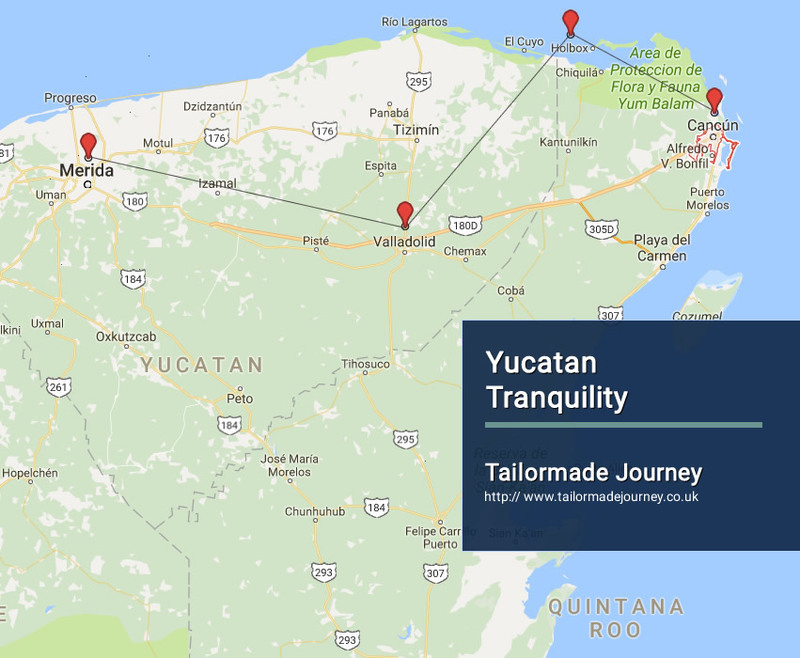 Toda you will depart Celestun for the Yucatan’s cultural crossroads at Merida, where you will enjoy a city tour before traveling onward to EkBalam, visit this fantastic and little-understood settlement. Virtually unknown until a few years ago, this Mayan center, whose name translates to “Black Jaguar,” appears to have been established as early 600BCE and maintained a pollution into the Spanish Conquest until 1600AD. Restoration began in earnest in the mid-1990s and the excavated structures with stuccos have yielded much improved understanding of the Mayan culture that once flourished here. During a privately guided tour, your expert local guide will show you the ball court and temples, including the great Acropolís, with winged human figures and a jaguar mouth entrance to what may have been the 9th Century King Ukit-Kan-Lek-Tok’s tomb. After the excursions we continue towards Valladolid, where you will sleep tonight atop a perfumery and wake to enjoy time in the Pueblo Magico of Valladolid and optional aroma therapy at CoquiCoqui. The view from the room at CoquiCoqui on the beautiful tropical garden, a little pool of fresh water and our tailored spa treatments will pamper you during this extraordinary experience. The suite benefits of a reassuring and colorful small-town sight, on the historical and charming Calzada de los Frailes, a few blocks away from the charming and full of life main Cathedral and walking distance from the silent and secluded Convent of San Bernardino de Siena. As life slows down, your senses will wake up in a new peaceful dimension. Overnight Stay at the Hotel in Valladolid. Enjoy a private tour after breakfast this morning to World Heritage and new Seven Wonder of the World Chichen Itza, under the expert knowledge of our guide, the ball courts, temples, and plazas come alive.. After the excursion, we return to the hotel where you can choose from two spa treatments: Coqui-Coqui Ritual or Swedish Massage. The CoquiCoqui house-created treatment starts with a Honey and sea salt scrub, after a rinse you will be wrapped in the powerful local aloe vera wrap, while it deeply hydrates and re-mineralyzes your skin, you will have a hair treatment and massage, after a shower, with your refreshed skin, you will feel blessed under an aromatherapy oil massage, and, for the grand finale, a candlelight experience of warm coconut milk and salts bath (3 hours). Enjoy optional spa treatment and a relaxing morning in Valladolid, depart by private vehicle for the ferry landing at Chiquilá, where you will board a private boat for Holbox Island and Casa Sandra. Enjoy a romantic dinner for two on the beach with a bottle of wine and three courses included. Overnight Stay at the Hotel in Holbox.